Q. The book/journal/dvd that I need is checked out. What do I do? You need to place a Hold on the material. Look for the "Place Hold" link and click it. There a two different places you can be coming from, through Find It or the library Catalogue. The first screenshot is from our Find It search results and the second from the library catalogue. Fill in your student/employee number and four-digit Library PIN. Select the campus where you would like to pick up the item - the default will be the campus you are on, but from home you will have to make a selection. You do not have to select a Not Needed After date. A message will appear confirming that the hold is placed for you. Click on "OK" at the bottom of the message. When the item is returned, we will hold it for 7 days at the library you requested. Ask at the service desk for them. 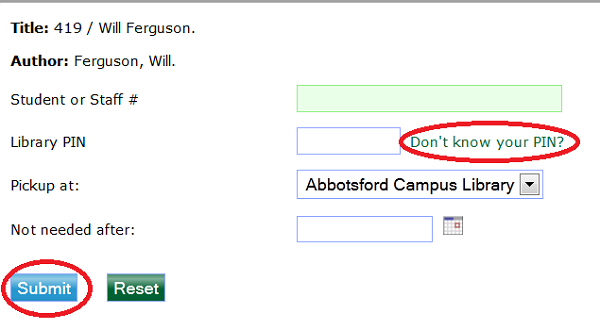 You will receive an email through MyUFV indicating that your hold is available and it will also show as Available in your library account. The library cannot guarantee the return date of the item. We notify the current user that the item is on hold and the responsibility is with them to return the item. Fines are $2.00 a day for items on hold.